Ian has served on the board of directors since October 2003. 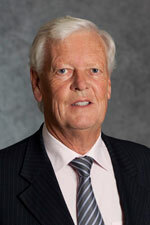 He previously served as chairman from May 2004 to February 2008, became co-chairman in January 2011 and assumed his current position as chairman in July 2012. He is chair of the Nominating and Corporate Governance Committee and also serves on the Audit and Compensation committees. A member of the Institute of Chartered Accountants of Scotland, Ian has more than 40 years of experience with public companies in the resources sector including the areas of promotion, financing, exploration, production and company management. He has participated in several notable projects in Africa, including the North Dome gas discovery in Qatar, Reunion Mining’s Scorpion zinc mine in Namibia, which was subsequently developed by Anglo American, and Ocean Diamond Mining, which pioneered the independent diamond dredging industry off the west coast of southern Africa. He also served as a director of Tanager Energy Inc. (formerly MGold Resources Inc.) until October 2011 and Belmore Resources (Holdings) plc until 2011 when it was acquired by Lundin Mining Ltd.
Ian was a director of Viatrade plc Georex SA. and Poros SAS. He resides in Vaud, Switzerland.